Pancreatic cancer is relatively uncommon, accounting for only 2.2% of all cancer cases in Australia. Therefore, some people may not fully understand the role of the pancreas and how cancer can develop here. 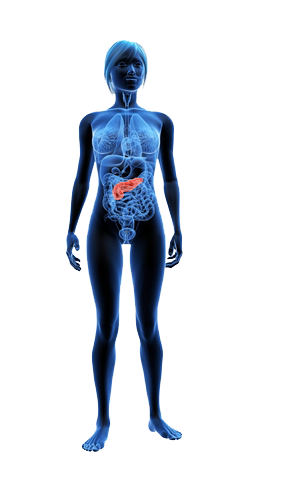 This section outlines the functions of the pancreas, as well as important information about pancreatic cancer, including possible causes, diagnosis and treatment. The pancreas is a 15-25 cm (6-10 inches) oblong flattened gland located within the abdomen, between the stomach and the spine. It has two main functions – to produce many important hormones, including insulin and glucagon, and to secrete pancreatic juice into the duodenum, which contains enzymes for digesting food so that nutrients can be readily absorbed in the gut. Uncinate process – The area of the pancreas that bends backwards and beneath the body of the pancreas. The uncinate process is where the superior mesenteric artery and vein, 2 crucial blood vessels, intersect. 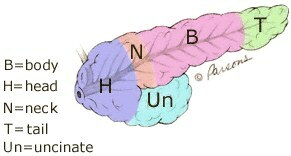 Head – The widest portion of the pancreas. Located on the right side of the abdomen, adjoins the second part of the duodenum. Neck – The thin region between the head and body of the pancreas. Body – The middle portion of pancreas between the neck and tail. The superior mesenteric blood vessels are located behind the body. Tail – The thin tip of pancreas in the left side of the pancreas, extending towards the spleen. The pancreas is made up of glandular tissue and ducts. The main pancreatic duct (duct of Wirsung) drains pancreatic fluid from the pancreas into the duodenum. There are many small ducts branching from the main duct. The pancreatic duct joins the bile duct to form the ampulla of Vater, where the duct widens prior to entering the duodenum. Many individuals also have a small accessory duct (duct of Santorini), which extends from the main duct to the duodenum. The endocrine cells of the pancreas – the Islets of Langerhans – are responsible for the production and secretion of many important hormones into the bloodstream. The main pancreatic hormones insulin and glucagon work concurrently to regulate blood sugar levels within the blood. Secreted directly into the bloodstream, insulin acts to lower the blood sugar level and increase the amount of glycogen (stored carbohydrate) in the liver. On the other hand, glucagon slowly increases the blood sugar level, if it falls too low. Diabetes results when the insulin secreting cells malfunction. The exocrine cells of the pancreas – acinar cells – secrete pancreatic juice into the duodenum, which contains digestive enzymes that help to breakdown carbohydrates, proteins and fats so that they can be adequately absorbed and utilised by the body.